Today only, January 31st, Amazon.com 现在这款9合1的电高压锅， Instant Pot DUO Plus 60 6 Quart 9-in-1 Multi- Use Programmable Pressure Cooker 降价后 for just $79.99 shipped (regularly $129.95). 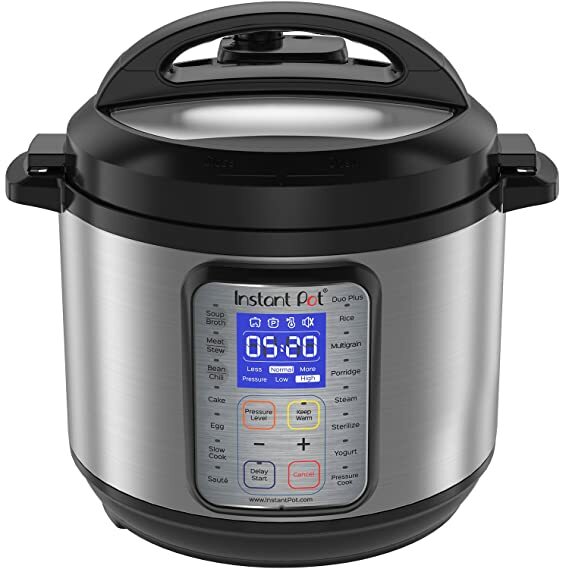 This Instant Pot features new and improved programs including 3 new programs – Cake (pressure cook soft and moist cakes), Egg (prepare perfect eggs in just a few minutes), and Sterilize (pasteurize milk, and sterilize baby bottles, jars, and utensils). The Duo Plus is designed with a large blue LCD display with a new user interface to adjust the cooking settings, pressure levels, keep-warm on/off at any time during the cooking process. There are also 4 new icons to easily view the status of the cooker, Heat, Pressure Cook, Keep Warm and Sound.